The Pentek Real-Time Recording Systems eliminate the time and risk associated with developing in house recording solutions. The Talon recorder platform is a complete off-the-shelf solution it is supplied with Pentek's SystemFlow Software to aid system integration and thereby reduce the time-to-market. Out of the box, all systems arrive as ready-to-run instruments with a full-featured virtual operator control panel ready for immediate data recording and/or playback operation. 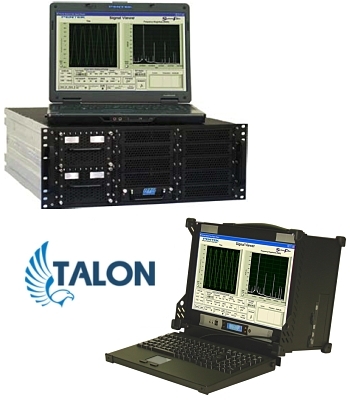 Talon systems are based on modular COTS board-level products and flexible control software, they are scalable for multi-channel, high speed sustained recording, making them ideal as a data acquisition resource for real-time embedded signal processing applications. A complete turnkey, multiband recording and playback system for recording and reproducing high-bandwidth signals. The recorder is controlled via SystemFlow® GUI with signal viewer analysis tool which includes a virtual oscilloscope and spectrum analyzer. up to 100TB SSD storage. up to 7.6TB SSD storage. up to 46TB SSD storage. up to 30TB Removable SSD storage. up to 15.36TB Removable SSD storage. up to 61TB SSD storage. up to 38.4TB SSD storage. A complete turnkey, Intelligent Signal Scanning Recorder (and playback) system with the ability to scan the 6 GHz spectrum for signals of interest and monitor or record bandwidths up to 40 MHz wide once a signal band of interest is detected. The spectral scan facility allows the user to sweep the spectrum at 30 GHz/sec, while threshold detection allows the system to automatically lock onto and record the signal bands. Scan results are displayed in a waterfall plot. up to 192TB SSD storage. All recording systems are supported with Pentek’s SystemFlow Recording Software suite. SystemFlow provides a rich set of features for controlling the data acquisition and recording functionality of these systems and ensures a consistent look and feel for developers across all RTS systems. SystemFlow’s GUI (graphical user interface) allows the operator to control all programmable hardware function parameters including gating, triggering, data formatting and clock selection on the various A/D, D/A, digital downconverter, and digital upconverter modules. A file management system supports recording and playback of data files on the RAID or JBOD with terabytes of storage and archiving of files to the host PC running Windows or Linux. Configuration profiles for specific hardware settings can be stored and retrieved to streamline setting up recurring measurement scenarios (ideal for Production Testing). 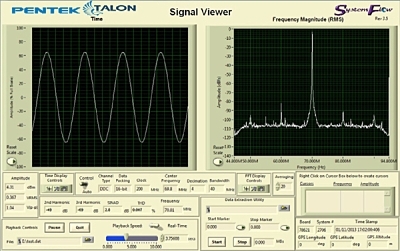 The SystemFlow Signal Viewer presents a calibrated time and frequency display of data files after signal acquisition and serves as a monitor of live input signals for a prerecording check. The SystemFlow API allows developers to configure and customize the subsystem interfaces and operation. Source code is supplied for all API functions, including real-time data acquisition, recording and playback functions and for the user-control software running on the host PC.